Yesterday we were able to register Boo for kindergarten. 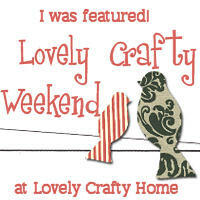 We got to meet her teacher and Boo even got to do a little craft while she was there. At the beginning of August will register the Princess for second grade. I hope to hear from her teacher next week. I also got an order for crocheted flower barrettes and I am starting on those now. Trying to get those finished, I am finding myself with a bit of an organizing problem. It involves my yarn. I have an entire shelf dedicated to storing yarn. It doesn't look very nice does it? And do you want to know something else? The shelf isn't big enough to hold it all. Here is another box and a bag sitting near the shelf. That bag has the rainbow yarn stash I've been using for the scarf, headbands and tote bag I made as well as wrapping some gifts. I still have a good bit of rainbow left. I have another full box and two more bags full of yarn. Want to see how I've organised them? Well, you kind of just did. I need suggestions on organizing all of my yarn. Here are the stipulations, I don't have a lot of room, I don't want to buy anything (or at least not spend more than $20) and I need to be able to easily move them from room to room as I crochet wherever I am at the moment. Give me your suggestions, please. It seems to be the time to organize this kind of stuff. I am currently trying to make sense of my cross-stich thread container. In regard to you question--Do you have anymore of the white bins that are in the second pic? If so, you could organize these by color or project. Great ideas, thanks! I did used to have all of it in a few of the boxes but my husband scavenged then for other things. Okay, so I just found a great idea that would be cheap! An over the door shoe organizer! You can hang it on the back of a closet door, and it's out of sight, out of mind! I actually use one for my travel biz, and put brochures & park maps for Disney, as well as postcards & such to send my clients. Don't know why I didn't think about this first! I got a 'clear' one at Wal-Mart or Target for about $13. I like the clear, because I can see what is in each pocket. I like that, thanks Marcie! I use a canvas closet sweater shelf thing that hangs from the rod in my craft closet and has 6 shelves. Then you can just put the yarn in there like you did in the first pic you posted. I'll be waiting for all the solutions as I have this problem as well. I hope we both find something. That isn't a bad idea, I could dress up the boxes with some fabric. I love that shelf. I wish I could afford to get something like that, the totes would be easy to carry around. Thanks for sharing! Those look great with the fabric. I should probably work on my fabric stash, but it takes up much less room. Where did you get the boxes and how much were they? PVC piping--buy the diameter needed,cut to the length needed, glue them together. You could even paint them to match a room. It could be a lot of fun gluing them into some spectacular or fun design. That could be fun. I am going to keep this in mind for when I have a bigger budget. Thanks, it is looking like it might be the most economical and easy to do. I just organized my daughters yarn. We took 4 inch PVC pipe and cut it into sections and hung them in her closet. She loves it and I love that there isn't yarn all over the place! I would love to see a picture. You could email it through the email link at the top of the sidebar. I'm sorry, but I am stumped. If I knew, I'd do it myself! My girls like going through mine. It gets tangled a good bit when they do. mine looks like yours - so I'm waiting for ideas too! New follower - sorry no help here - good luck!! That is what I had before, but I was hoping for something a little better. Boxes were easy. I saw a great wine rack with yarn on Pinterest, but I can't afford that. I think I am going back and forth between a box or the shoe organizer. I probably have enough to fill five shoe organizers though. Very creative. I only have one shoe organizer and I'm using it for shoes. Not very creative of me. Thanks for your help! I find the squishier the skein gets, the more it tangles. So after I have used some yarn and it doesn't hold it's shape anymore I wind it in a ball and keep it in a clear plastic comtainer. 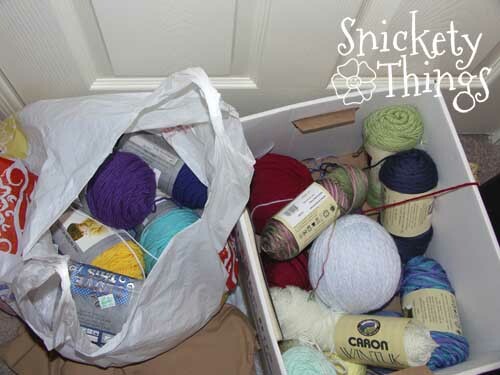 You could do the same by keeping the skeins that still hold their shape on the shelf and the rolled ones in your box. As you accumulate more yarn, eventually you may need more boxes and then you could sort by color but I usually sort my yarn first by weight then by color. Can you tell I have a lot of yarn! Some of my rolled balls of yarn I have put under the glass dome of my cake plate so I turned storage into decoration (until I have to make a cake!). I usually have to roll mine into a ball, too. I like the cake plate idea. I have those sitting around and I bet it looks nice with the balls. I just reorganized my yarn, AGAIN! I had it in clear plastic shoe boxes by color, but it outgrew the closet it was in. I am a weaver, and have significantly more than you do. I finally came up with gallon sized zipper bags. I put yarn in bags by color, and then pushed the air out before closing it. This way they can sit upright on the shelves like books, and you can see everything. You can get a lot more in the same space, and it stays dust free. 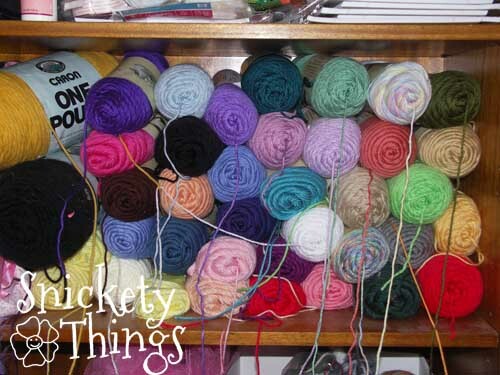 You could actually get all the yarn shown in your photos into that space on your shelf that you are currently using. I was amazed at how much I could fit in. I have room for more yarn! I may use the plastic bags for some of the yarns i don't use often, I like that idea. Thanks for stopping by! Thanks Kelley! I will e there. I do something similar with each skein I have. I cut a snip and drop it into a page protector with all of the same brand/weight yarns, attached to a note with its color. It also has one band with the care instructions for each type of yarn. It makes it easier to know what I have and keeps me from buying more than I need. I am not by far running out of living space due to yarn. Other things maybe, but not yarn. Thank you for stopping by! I hope you visit again. Thanks for the info. I am still looking for something. We are rearranging the house right now so the project was put on hold for now.